The classic rolled style park bench features the same ribbed steel as our classic series, but also has rolled edges for a sleek look and comfort. Its modern appearance takes an ordinary bench and makes it fun and interesting for all park visitors. 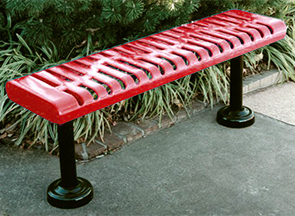 Benches come in 4', 6' or 8' length models; can be ordered in a portable, in-ground or surface mount; and optional grout covers can also be ordered with the in-ground and surface mounts to add to the appeal of this unique bench. Optional grout covers and frame are powder-coated to match. Bench seat is available in the color options shown below with in a lightly textured matte Polyethylene finish.